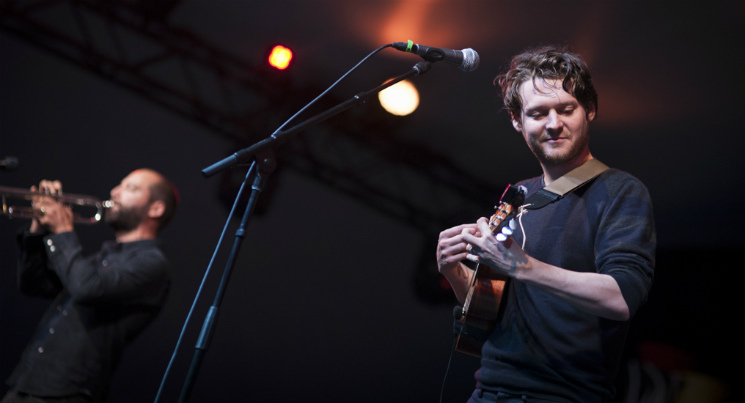 Beirut's Zach Condon should have a lot to talk about. Since the release of 2011's The Rip Tide, Beirut's tousle-haired frontman has had a lot going on, including a messy divorce, hospitalization for exhaustion, the cancellation of a world tour, a new love in Istanbul and his first-ever gig in the city that christened his band of old-world troubadours. And oh yeah, somewhere amidst all that personal upheaval, Condon also found time to write a new nine-song album, No No No, due out in early September. So it was a bit of a surprise that, on a cold and drizzly Sunday night (June 28) in Confederation Park at the TD Ottawa Jazz Festival, Condon was mostly content to let Beirut's music do the talking. For 90 minutes, the Brooklyn six-piece ploughed through a wide-ranging set that dug into all corners of the band's discography, setting the distinctly Balkan sounds from their debut Gulag Orkestar right up against stately indie pop tunes like "East Harlem" and the evocatively titled "My Night With The Prostitute From Marseilles," off of 2009's March of the Zapotec/Holland EP. Not that it felt like anyone in attendance really minded Condon's reticence: given the un-summery conditions, the only real way to forget the weather was to bask in the warmth of Beirut's rich horn section and Condon's melancholic crooning, anyways. And to be honest, when you consider how rare it's been to see Beirut's name pop up on a festival schedule lately — they've only played slightly north of a dozen dates over the past two years — it's kind of admirable that the band decided to make Sunday night in Ottawa all about the music, any potential layoff-induced rustiness be damned. "Now that we're getting comfortable in the dark…" Condon started at one point, as he introduced the title track (and first single) off of No No No. For a moment, it felt as if he were going to share an amusing story, perhaps, from his turbulent past few years traveling the globe. But then the keyboards kicked in, carried along by Nick Petree's drumming, and it was back to what Beirut does best: letting their songs, rather than their stage banter, tell the tales.